There's been a swing back towards brewing lagers in the craftier realm of Australia's broad beer spectrum in recent times. Yet there's still not too many small brewers who've put one front and centre of their core range. 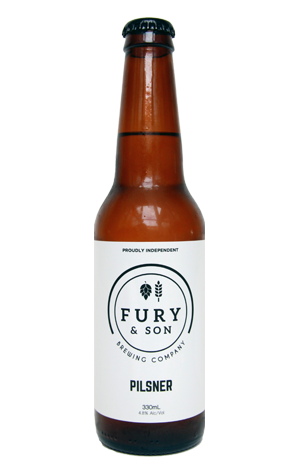 However, this New World Pilsner is one of Fury & Son's two launch beers, alongside an American style Pale Ale. New World pilsners – particularly those popularised in New Zealand – can be relatively full on; a step or two above where the new-to-craft beer drinkers that Fury & Son are presumably targeting with this beer sit, particularly on the bitterness front. But here they've kept things within this hazy pale yellow lager relatively toned down. It leads off with some soft lemon / lime curd aromas and a hint of spiciness. It's just as soft on the palate: citrusy with a gentle, vaguely resinous bitterness.